This is a long overdue review but here goes. One of the items that had been eluding me on a quest to put together costumes for all 11 Doctors was a proper looking 5th Doctor frock coat. When I first embarked on this journey in early 2007, budget constraints meant we were forced to go with a rather cheap solution I'd found online from a previous cosplayer. That plan was to take a lab coat, modify it, dye it beige and add red piping/bias tape. The result did the job and can't be beat cost-wise for a $50.00 investment. Although I was never really happy with it. I wanted to upgrade. 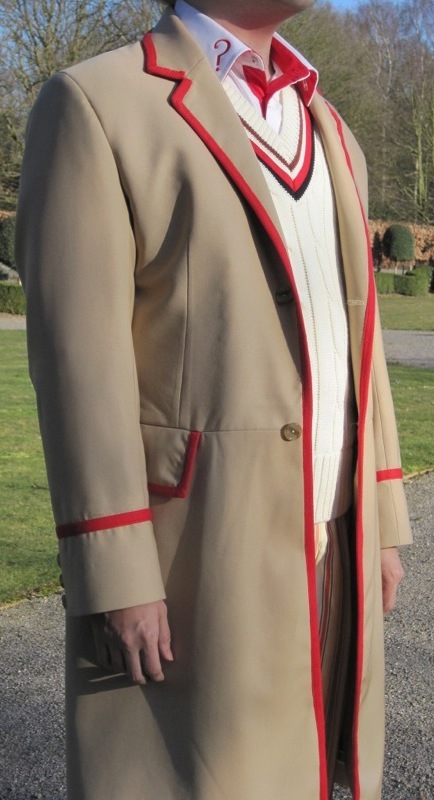 In June of 2009, my plans to commission a nice high end 6th Doctor frock coat crashed to a halt thanks to the untimely withdrawal of one of the better custom tailors to work on Dr. Who costumes (and really the only game in town if you wanted a quality Colin Baker coat). As a consequence, my attentions then turned back to the Davison coat. My plan was to have it ready for the '09 Comic Con so I duly ordered one with a 3 week rush turnaround from a well known online provider of custom clothing. What I got back was severely disappointing. The fit was wrong. It had no flare in the skirt and draped rather like a shapeless box. This might work for an overcoat maybe, a frock coat - no. The lapels were too narrow and rounded, the front buttons too high set, strange vertical seams were present below the waistline that simply shouldn't have been there and finally, the fabric was too dark of a beige. Now I'll take the blame for the last part as I chose the fabric locally and it looked great in the store. As Steve has previously posted about, color is quite tricky especially when it comes to the all important lighting conditions. It was an expensive lesson learned. I was told by the online tailor in question it could be fixed for a nominal fee. I sensed if it was this far off the mark to being with, then they would never get it right so I passed. Soon after, I re-sold this coat and recouped what little I could from this misstep. I never even took it with me to Comic Con. The deadline was no longer an issue, but no decent coat to show for it. Now what? Finally I did what I should have done from day one- which was turn to Steve Ricks, king of the impossible. I'd long admired Steve's work on his 10th Doctor coats and thought he would be a natural choice to re-commission a new 5th Doctor frock. Not only does he have the skills but he is, most importantly, a fellow Who fan who cares about the details just as much as you do. It turned out by happy coincidence that he was a fan of the 5th Doctor and had wanted to have a go at making the coat anyway. So we determined a payment schedule, I made my deposit in August of 2009 and we were off the races. Little did I realize the race would take over 5 months to complete. There were a few factors holding us up. All of this is well documented already on this blog already but the short of it was - Steve was having to draw up the pattern almost from scratch, brushing up on his skills and finding similar garments to dissect and study. All of this paid off handsomely when in October, he delivered the test coat he'd made from white calico fabric. I was shocked at how good it already looked and how much *better* it was then my previous coat I'd picked up in July. The skirt flared, the fit was solid in all the right places, the button spacing looked right, the lapels looked great. I breathed a sigh of relief! After doing come comparisons to Season 19 production stills (and taking into account my own measurements) we both agreed on a few minor tweaks to the placement and width of the side pockets and adding a touch more length to the skirt. In the meantime, we went through the process of picking materials. Steve is very well organized and had sent me 2 or 3 well laid out selections of swatches for wools and acetate/satin linings, buttons and trims. We quickly decided on the buttons and the red-orange trim. I had narrowed down my choice of lining to two options depending on the wool. The only major hitch now was finding the right beige wool. I mean how hard can it be to find a 5th Doctor beige wool? Having been burned the 1st time I was extra careful choosing a replacement. Steve outlines this well in his blog, but this proved *really* tricky! We both searched high and low for about 3 months. Most of what we turned up was usually too brown, too grey, too green or too light/dark. Aiming for the Season 19 frock, I really wanted it to have that warm undertone of red or yellow in it. The few times I found a color I liked it was often not suitable fabric (50% wool/Lycra mix, cashmere etc). It was looking rather impossible. Finally after some help from a friend of mine who has a better eye for color than I do, (and a plethora of photoshop tests) I settled on one of the early swatches I found at B Black and Sons here in Los Angeles. It was a great color, BUT it was pretty pricey. almost 5 times what was budgeted. Once I made the decision I had to save up extra for it. When I went to buy it in December, I discovered to my disappointment that they were sold out and could not order more in. (They had sold out back in October no less!). By sheer luck, they had just gotten in another beige wool which was nearly as good and much more affordable. Steve had reservations due to how red it looked in certain light. Not taking any chances, I did another round of photo tests. It was quickly clear to me this new gaberdine was indeed a suitable replacement and bought my yardage. Based on this, I leaned to a more silver/taupe of the lining choices. The materials were finally all selected. The making of the frock coat could finally commence! My only 'deadline' was to have it ready in time for Gallifrey 2010 and here Steve came through, the coat was indeed ready by the convention date. To further bring my costume up to snuff, I added an order of Season 19 Five trousers to the order as well which Steve happily obliged. I followed his blog while he was in the process of making the coat and he kept me up to date frequently on the progress. I was smiling wider and wider the more I saw this coat come together. Both of us were impressed how well the beige wool was photographing, pleased that the long fabric hunt had not gone in vain! Steve was always openly communicating along the way- even accomodating a last minute lapel tweak request from my end and altering it accordingly. I'm sure it was an added headache but he came though like always. 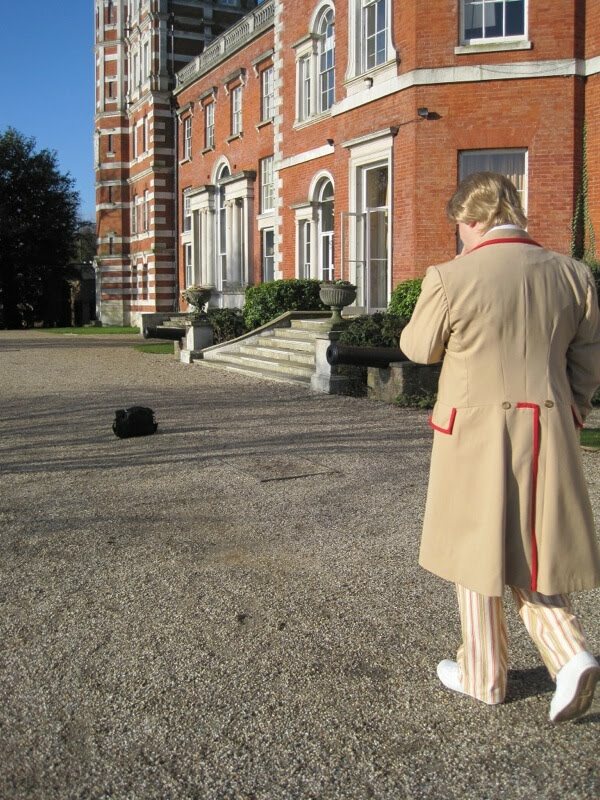 Finally in February of 2010 - I saw the finished coat and I was beyond pleased. 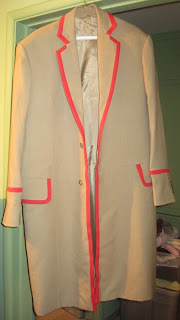 I was going to own a top quality replica of the 5th Doctor's coat at last! The last hitch: due to logictics of travelling to the UK the following month and my desire to have 5 Doctor costumes for the Time Quest event, I had to ask Steve to hang on to the frock coat and trousers so I could collect them in person. It was a hard choice, but necessary. 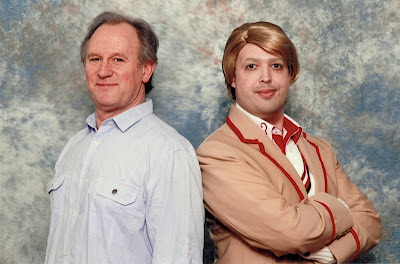 On the plus side, when I did arrive in England and Steve presented me with my coat on the first Day of Time Quest (for my photo with Peter Davison!) I was really blown away by the finished piece. I couldn't help but thank Steve profusely as he'd brought into existance one of my top costuming dreams. 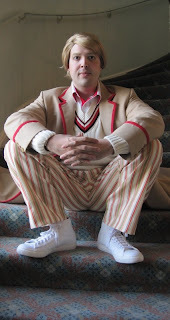 Once the entire costume was all together I felt like I was wearing Peter Davison's real costume for a moment. It doens't get much better than that. What else can be said about Steve's work on this Peter Davison coat? It's absolutely smashing. It's a stop and look twice kind of coat. The quality of the tailoring is really top notch. When wearing this, it *feels* like a nice coat you'd see at the department store. I've gotten several compliemnts on it form my American friends when they've seen it. It's a labor of love and a beautiful coat. Steve tailored the fit just the way I wanted, went above and beyond to determine the finer points of the pattern to get the pockets, seams to all come together just right! His feedback and suggestions are stellar and his prices/payment schedule are reasonable. What more can you ask? I cannot thank Steve enough. 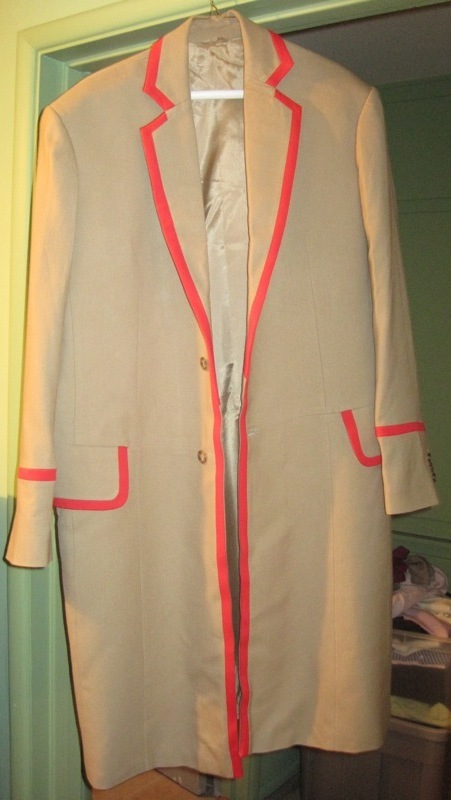 If you're ever in the market for a Peter Davison Frock coat (or even a brown varient one!) then Steve's the man to see. I'm often asked by my less costume-inclined friends "Was all the months of waiting, all the resoucres spent, all the stress of going beige colorblind worth it for this coat?" You Bet. No Question! It honestly looks like it could be the real article in the pictures! The coat looks simply fantastic -- beautiful worksmanship, you can tell a lot of time and care went into creating this coat. I will also say that I have bought from B Black & Sons, and they are wonderful to deal with. Their fabrics are high quality. I recently ordered a Five Coat from Steve, and I can only echo Bob's glowing review. In addition to it being incredibly accurate, it's an amazing coat by itself. I literally had strangers coming up to me and complimenting it. If you want a Five Coat, all you have to do is go to Steve. It's that simple, and I promise, you'll be as impressed and pleased with the final result as I am with mine. Reading this review and knowing the work that has gone into that coat, seeing the clearly flawless results, I can hardly stop myself from feeling inclined to go on my own voyage of perfection. Indeed as I type, words and phrases such as 'frock coat', 'long', 'light', 'easily washable', 'hard wearing', 'multi pocketed', 'moderately water proof' and 'deserved replacement' are flooding through my head and causing all kinds of mischief. 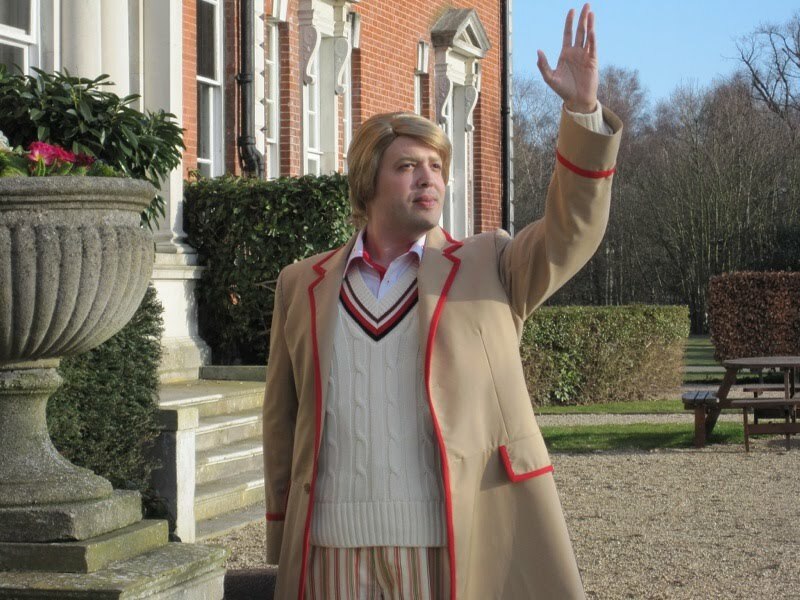 Quite like watching Doctor Who in that sense, you're always left energised and wanting to go on a similar adventure. -I've read most of your blogs and I find the results amazing, and what you write very interesting. 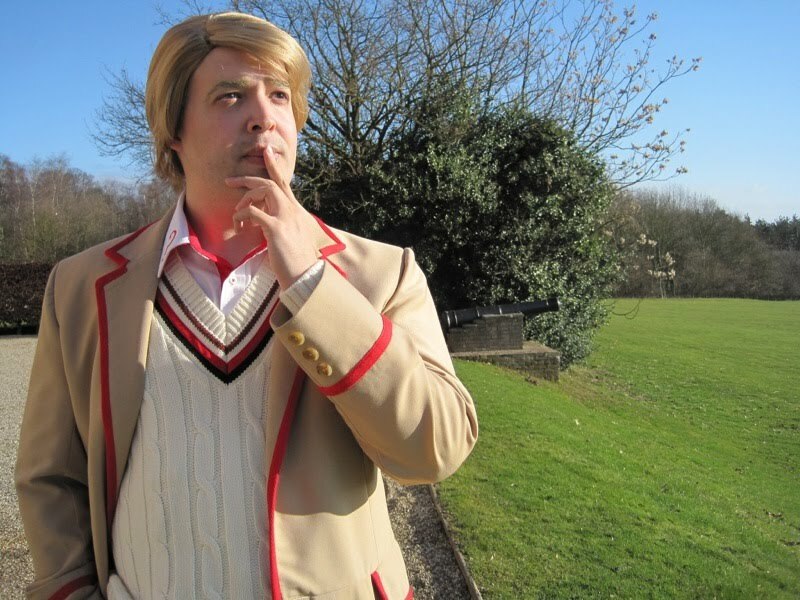 -You got me into cosplaying the fifth doctor ; as a french person I would not be recognized a lot in conventions, because Classic Doctor Who is a bit obscure in France, but I don't care ; it' was hard but I enjoyed the heck outta it. Thanks, really. -I'm actually making a celery, and by the time I finished it the only thing missing from my own costume will be a decent wig ; as a brown-haired dude with very long hair, I desperately need one, and yours looks incredible ! So I really want to ask you were you got it, or how it was made. If it's explained on some part of your blog that I missed, I deeply apologize. 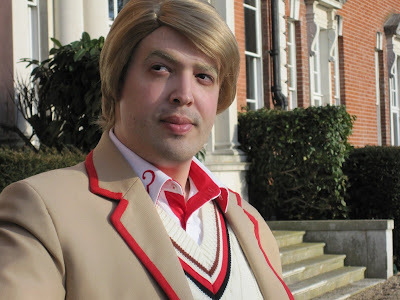 Just the pictures on this page have helped me immensely in creating my own Fifth Doctor costume. Wonderful. Simply wonderful. Thank you! I am also in a quest of cosplaying the 5th doctor. I have additional difficulties to overcome being allergic to wool and a girl. I considered crossplaying, but I personally prefer just doing a femme version. I am basically going to have to make everything from scratch including the cricket sweater (good thing I am persistent) and of course the frock coat. This post helped me a lot, but I was wondering if in your search for fabric you ever came across any synthetic one that would come close to the colour of the original frock coat? Again, your blog is great and so is that magnificent coat, kudos. I have a colour-matched gaberdine which is a polyester viscose. If you contact me direct at tennantcoat@me.com I would be willing to sell it by the metre. Any suggestions for finding the cricket jumper? I've been having a hard time and will probably just end up ordering a custom made one.